In the Christian culture of confession , one of the seven Holy Sacraments, in which man, the sinner in essence, tells his sins to the priest, receives forgiveness of visible and invisible is cleared from what hurts and does not live. Confession for believers – a place where you can tell about your pain. 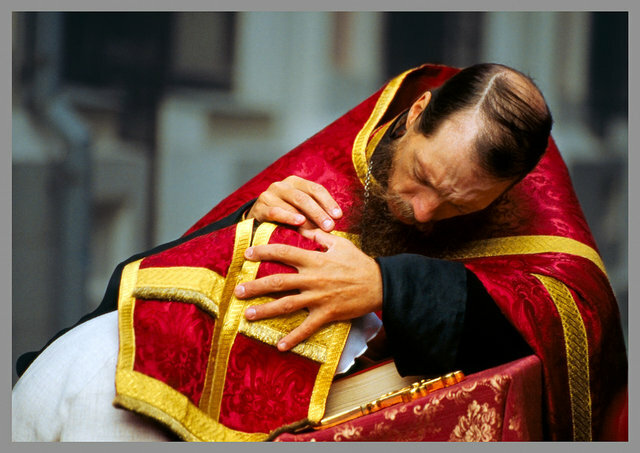 To confession Orthodox should be approached responsibly, it is desirable to prepare in advance. If you sin enough or did not manage to build a logical story-a statement of all that need to be forgiven, entrust your thoughts to paper. So you will not end up talking to a priest in the Church, especially if around other people. Own conscience in preparation for confession compare with the ten Beatitudes, they are known to every believer since childhood, because quite often mentioned in everyday life. Remember, if you hide something in confession, the secret is not from the priest-man, but from Jesus Christ himself. Making a list of sins, keep in mind the approximate list, which can be divided into three groups: sins against God (unbelief, the mention of the name of the Lord in vain, thoughts of suicide, ingratitude to God, playing cards, non-posts, and many others), sins against neighbors (arrogance, short temper, anger, revenge, sarcasm, quarrels with neighbors) and sins against himself (profanity, vanity, lying, drunkenness, adultery). Do not be afraid of their own sins, they should in no way stand between you and a visit to the Church on confession. Remember that God wants the very desire of the soul to repentance. Don't worry that the priest will be shocked or even amazed by the list of your unrighteous acts. Believe me, the Church saw no such sinners repenting their deeds. The priest, like anyone else, knows that people are weak and without God's help are unable to cope with demonic temptations. If there are doubts about the reputation of the priest performing the Sacrament of confession, please note that confession remains in force no matter how sinful a priest is, provided that you repent to truly. For the first confession the week choose a time when the temple is not so many people. You can ask in advance the advice of friends, to what priest and to what temple it is best to go with first confessionth. Respect other professing not closely next to the priest, and in any case do not be late to the beginning of the procedure, otherwise you will not be admitted to the Holy Sacrament. For the future develop a nightly habit to analyze the events of the day and daily to repent before God, and the most serious sins record for a future confession. Be sure to apologize to all our neighbors who have offended, albeit unintentionally. Women can not go to confession and to attend the temple at all in the period of the monthly purification. Do not take confession as interrogation, and particularly the intimate details of personal life do not tell the priest in paints. A brief mention of them. The sacrament of confession along with baptism, communion, and wedding, is one of the major rites of the Christian Church. According to the Scriptures, to come to confession relies seven years and then throughout life, until death. However, not all begin to confess from an early age. Moreover, many Christians even before big Church holidays, when you need to repent and commune, afraid or unwilling to go to the Confessor, because I feel awkward. And some would like to confess, but I've heard that this Ordinance is necessary to prepare in advance and how? In any case, before you decide on the General (first in my life) confession, you need to learn all the basic religious truths concerning the confession. Prepare for confession at home. Take a pen and paper and write down all your sins remember for the last time. Who should go first deadly sins: pride, lust, envy, gluttony, sloth, anger, greed. If you're guilty of murder (abortion, the Church also believes murder), be sure to write down that sin in the beginning. Also list all their sinful acts, for example, viewing entertainment programs inappropriate content on television, visiting fortune tellers, and so on). Remember that this piece you can take with you to confession and read it. Sometimes the priest can take out of your hands with a sheet of sins, and he read them. Find out when confession is held in the temple, where you want to go. As a rule, all the priests profess on Sunday, but the week can also be the Sacrament of confession. Going to Church, dress appropriately: for men's shirt or shirt with sleeves, no shorts. For women – skirt is not above knee length, headscarf, no makeup, at least lipstick, as you will need to attach his lips to the cross. In the temple, ask where confess, as a rule, the priest is a small place. Be prepared for the fact that even before the confession, the priest will begin to ask you questions. For example, do you pray constantly, you think about God did not create yourself an idol. And also: not are with someone quarrel, and compliance with the conditions under which forgiveness of sins will enter into force. According to Church rules, these terms – faith in Christ, sincere repentance of all sins and hope to start after repentance a new sinless life. If you confess for the first time, be sure to tell the priest. Remember that the departure of the Confessor to the house possible only if people are sick or dying. If the priest in the confessional took you from the hands of a leaf with enumeration of your sins, and broke it, then the Sacrament of confession is over, you are given absolution. First confession in however many years you have committed, is considered General. Her need to confess the Lord in all his major (mortal) sins, even if listing them would take a lot of time. One of the major Sacraments of Christianity is confession. On it the believer recalls his sins, repents of them, and asks God's forgiveness. He who asks mercy of the Heavenly Father, always gets her, but the repentance must be sincere and active. You need to be aware of what you are guilty before God and man. Not only all known mortal sins – murder, theft, adultery, abortion, but daily sins, which permeated our life.Serious sin – indifference and amiloride to people. If you judge and condemn your neighbor – you have sinned condemnation. If you say that a sinless and righteous – sinful pride and self-praise. If you swear, smoke, drink, if irritable and angry, if you thought wished offended you evil man – you have sinned.A very common sin – the serpent. And do not be misled by the fact that the fortune teller as if praying before reveal your future or solve your problems. She suffers, and most likely, knows this. And you know that too fell into sin. Only gentlemen need to ask for help, and only on His grace rely.Sin is the indifference and neglect of prayer, the mention of the name of the Lord in vain, laziness and gluttony. Remember all your sins, write them down on a sheet of paper, so as not to get lost and not to forget in the confessional. And most importantly - sincerely forgive their abusers. Christians of all denominations pray the Lord: "And forgive us our debts, as we leave our debtors." If you do not forgive the debtor, whether to ask for forgiveness for their sins? 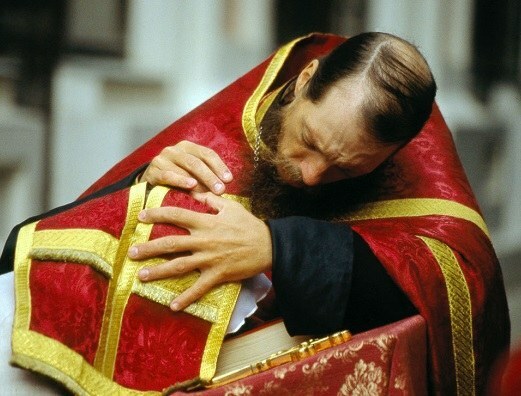 Confession usually starts before the beginning of the divine Liturgy. Listen carefully to the prayer of General confession in which the priest asks God's forgiveness for the many sins, and too mentally ask forgiveness of God. Then starts an individual confession, when each penitent approaches the priest and confess before the Lord his sins, both voluntary and involuntary.Do not attempt to refer to the circumstances or the fact that you are in sin brought by someone else. If you yourself justify the means are not justified of God. The priest allows the sins of the penitent, not his will but the name of the Lord. After the priest read the prayer, kiss the Cross and the gospel lying on the lectern. If you want to partake of the Holy Mysteries, it is necessary to fast at least three days. To confession it is better to go the night before to the day of Communion at the Service not to be distracted by anything, completely focusing on prayer.Before bed on the eve of the Sacrament, besides the usual prayers at bedtime, you need to read the penitential Canon, canons to the most Holy Theotokos, Guardian angel and partaking of the Sacrament. Come to Communion with arms crossed on the chest, with humility and gratitude to the Lord for his mercy. 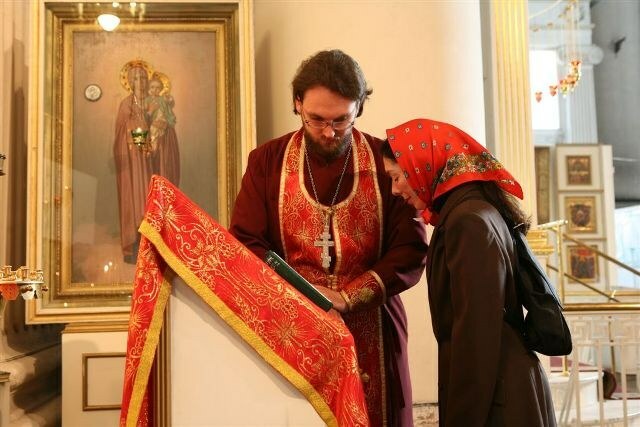 After partaking of the Sacrament, listen to the prayer of thanksgiving.If you do not perceive by ear the Church Slavonic language at home before the icons, read the prayer on their own. Try as much as possible to keep the purity that you got after confession and Communion. Remember that there is no Unforgiven sin is unrepentant. Confession is a sacrament in which a person recognizes God in their sins and asks for forgiveness. In other words, this is a Frank conversation with God. A serious discussion requires preparation. First of all, a man must feel a need to repent before God in their sins. To confession we need to start not only with an awareness of sins, but also with a desire to purge them and never to repeat such. Select the temple in which want to confess. Find out when it is the sacrament of penance. In preparation for confession is given 3 days in which to fast. This time a person should spend in seclusion to bring order to their thoughts and feelings. 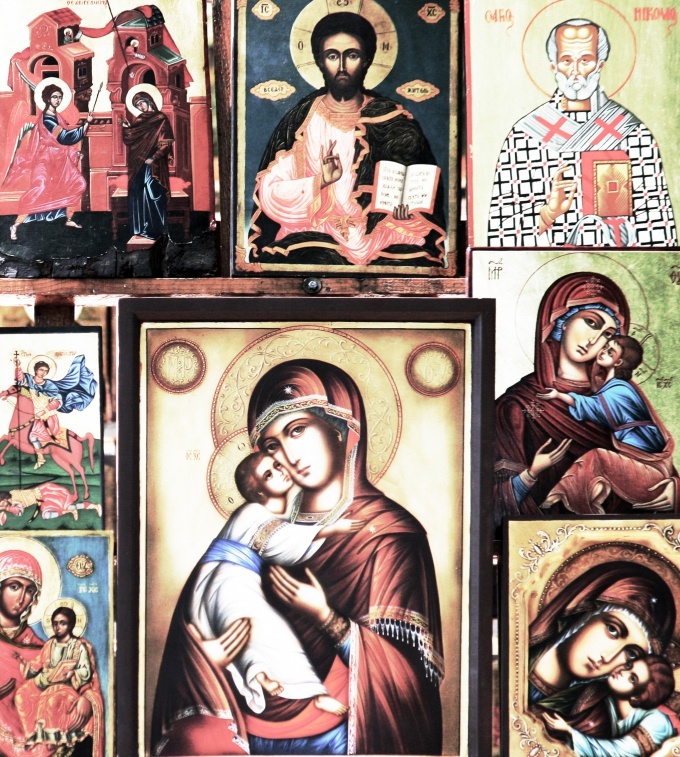 During this time, you need to read the Canon of Repentance, Theotokos, Guardian angel. These canons can be found in the prayer book. The sins which are going to repent, it is better to record. Then with this list, you can go to the priest. To understand what is sin, you need to reread the 10 commandments of God. Every sin is not only important to remember and record, but also to recognize it as evil, ruining lives. That is repentance, and sincere repentance bring the soul relief. After repentance should partake of the sacrament. Participation in this sacrament is not part of the confession. But if you want to partake, then it should also be prepared. In the prayer book you need to read "the Service for Holy Communion". From midnight of the day of communion can not eat or drink. Getting to confession, remember, you came to repent before God. That's it, you're going to vent. So do not be embarrassed priest – he is the link between you and the Lord. Anything you tell him will stay between you. When it was your turn to confess, listen to the priest and follow everything he says. If this is your first confession, tell him about it, he will help you and tell you what to do. Tell your sins without reserve. In any case don't justify things, which I confess. Don't ask the priest's advice. Respond honestly to all his questions. If you in the confessional is not the first time, remember that it is not possible to repent of the same sin if he had not been re-done. 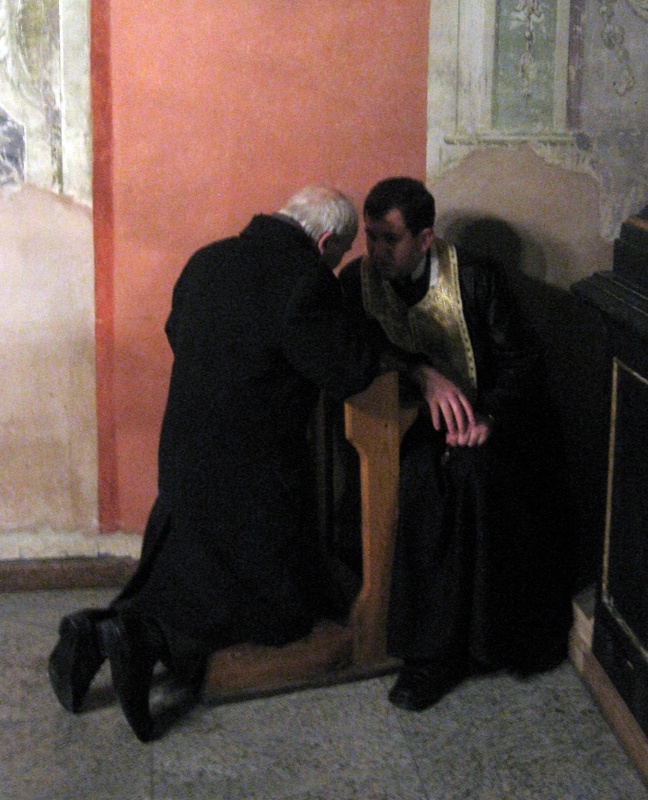 At the end of confession the priest will give you instruction and will offer communion. How often do you need to confess? Man sins daily. You need to confess to him as often as he feels and decides. There are no strict rules. Importantly, repentance is not a formal enumeration of sins. But the priests are United in the opinion that for a Christian confession should not be disposable in nature. To confession regularly, and how often, a person defines himself. If a soul sin, if hard on the heart, if you want to understand yourself - it's time to go to confession. Repent bad deeds, pray, ask forgiveness - God listens. Confession refers to the Church as a conversation with God in which the Confessor says that weighing on his soul, begging for help. The priest here acts as the mediator, he is the helper of God on earth. Therefore do not be ashamed of their mistakes. Coming to confession, you should talk about their problems, without hiding anything – it will help you to find emotional balance and to calm down. It is best to start your confession with, what excites you at this very moment, now. It is important not to lose sight of those details that may seem insignificant. At the same time, we must realize that confession is not just talk, talk, and religious rite the aim of which is repentance ispoveduyuschaya. People need to understand that once he decided to fix his life, no way back. We cannot commit sins, knowing that if necessary you can resort to confession and be forgiven. But sin is not the only reason to go to confession. When sick at heart, and you can't understand it then God help. The priest can be trusted. He can't tell anyone about your secret. Going to confession, you must remember that the Church will not judge you for your sins. After all, what you came to confession, already talking about repentance and the decision to rectify the situation. The priests say that confession must be regular. If you do not understand something, you can ask his Confessor – he happily will explain everything to you. It is important to remember that the priest will be around to help you, so do not hesitate to contact him for help and advice. If you have committed some sin already confessed and according to it, talking about it again we should not, unless it was done repeatedly. In addition, you need to take into account that one confession is not enough. Need to turn to God, asking for forgiveness and absolution, go to Church, honor of the Christian celebration and tradition. Confession – not really a simple mystery, not everything can be solved on it. But if you already feel ready to go to Church and confess, you should be prepared for frankness. What to say in confession – this will tell you your soul and conscience. Don't be afraid and ask God for forgiveness. Repentance and purification is a process that requires a certain amount of time. Not everything comes at once. So you need to gain strength and patience. One of the main rites of Christianity is the sacrament of confession. According to the Bible, get to confession, you need seven years to end of life. To avoid errors during this ceremony, must be carefully prepared. Prepare in advance what you will say father. This is best done in solitude. Take a clean sheet of paper, pencil or pen and remember all the bad things you've done lately. The first thing to remember mortal sins, they must be written in the beginning. This sheet you can take to confession and read it, so that shall describe everything as detailed as possible and clearly. This will help you in case if you will not be able to speak for themselves. Just ask the priest to read everything that is written on the sheet. Starting to be valedictorian, be absolutely sincere. You must fully confess their sins. Take the sacrament more seriously, because it is designed to cleanse you and your soul. You need to not just list all your sins, but to confess them, to prove that you really regret it and want to change. And to prove, especially to yourself. As a rule, the first is a General confession during which the priest can remind about the most common sins, and then individually. Listen carefully to what you say because you may not even be aware that we have sinned. Remember that you can't take the priest too much time, because in the Church a lot of parishioners, and everyone needs to speak. This is one of the most important rules concerning how to confess. If you are ready for a serious repentance, ask the priest to give you the General hours-long confessions, in which I recall all the sins you have committed since the age of seven. Don't think of what to say to the priest, just open your heart and tell him about all the experiences that have been accumulating in you for the entire life. To be truly cleansed, confession must be made on a regular basis.